Designed by Thomas Bastide in 2009, 12 7/8 inches tall, 26 1/2 oz capacity. 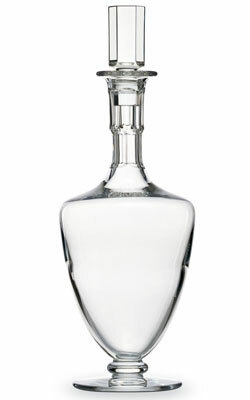 3.5 inches tall, inspired by the glass created by Baccarat in 1889 for the inauguration of the Eiffel Tower. 3.5 inches tall by 2.8 inches wide, sand engraved with the portrait of a man with a depiction of New York speak-easies in the background. 3.5 inches tall by 2.8 inches wide, sand engraved with a flock of majestic birds, the Great Wave of Kanagawa, and the snow-capped Mount Fuji.